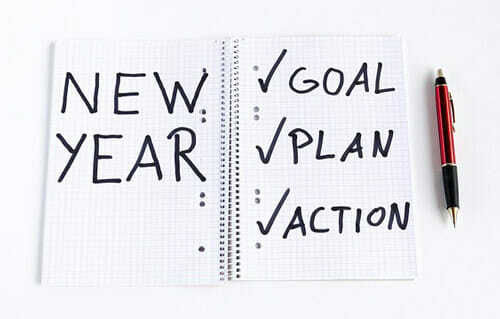 Most people set a broad New Year’s Resolution, one that they have probably set a number of times before. While setting a New Year’s resolution feels positive at the time, the outcome can end up feeling quite negative. For example: if your goal is to lose 20 lbs by April, and you don’t achieve this, or don’t even make it out of January, the same old yearly cycle repeats itself – you’re not even halfway through the year and already you’re feeling down on yourself for not being able to shift the weight. The outcome is that you continue with the same habits that have controlled your weight your whole life: unhealthy diet, minimal exercise, emotional eating, etc. This is the reason gym owners love January; because the New Year’s Resolution culture drives people to sign up and commit to a membership that rarely gets used after a couple of weeks. But people keep paying because, like every year before, they have an emotional attachment to the resolution they’ve set. This is something that they are going to do: when they have time, when they have the energy, when they feel good about themselves. You see, setting a New Year’s Resolution becomes a habit in itself; it’s just something you do each year as a token gesture to the year’s end. But how serious are you about actually committing to that resolution? What happens to most people is that they just slip back into the same old story. You spend the better part of January feeling good about the potential of a New Year and the idea of wiping the slate clean and starting again, but you haven’t actually taken the time to take stock of your life and assess where you’re at: what’s really important, what you really want out of life? I recommend making a commitment, not a resolution. No one cares whether you break a New Year’s resolution, because the majority of people break them by the end of January anyway. They are made to be broken. It’s almost a running joke: “Oh, you couldn’t quit? Me neither. Let’s go grab a drink”. So you just become become like everyone else, every single year. You settle back into the same story, the same habits, the same cycle. I’m going to appreciate my life more and be grateful for the small blessings. The truth is that there is nothing unique about these statements, so why do they need to be resolutions? You most likely think and say things like this all year round, which proves that you’re not really serious about doing them. The only way to truly make a change is to make a solid commitment. And to accept that with that commitment will come some suffering. Creating sustainable, positive change takes hard work. It means being uncomfortable sometimes. To explain what I mean, I’ll use myself as an example. Back in 2017, I decided that I needed to improve my cardiovascular fitness. I played sports throughout my teenage years and my 20s, but for the past five years I’d only really been lifting weights in the gym and walking a fair bit. I was asked to participate in a run, and in doing so realized that I was actually quite unfit. So I made a commitment to myself that I would become the best runner that I could. But just saying that wasn’t good enough on its own. So I took the simple step of committing to doing something every day to make that happen. I ran three times a week, without fail, and then ran a local race (Parkrun) on a Saturday. On the days I wasn’t running, I would do something to contribute to becoming a better runner. That might include reading up on running technique and training schedules, or doing core exercises or light stretches at home. It might also include reading a book on running, or an autobiography by a famous runner. When you really want to achieve something, you have to commit. What’s the point in doing something if you aren’t going to give it your best shot? Of course there are days when you don’t feel like going for a run, attending your class, or whatever it is that you have committed to. There are days when you lack energy and focus, when you are tired and stressed out, when it’s raining and cold outside. But these are the barriers you need to break down to prevent yourself slipping back into your old habits, which form the very reasons that people’s New Year’s resolutions are seldom successful. In addition, overcoming these barriers will make you a happier, more positive, more capable person. You will also begin to inspire others. Your relationships and experience of the world will become far more rewarding. Fast forward to 2018 and I have knocked seven minutes off my 5K time, and recently placed 11th out of 200 or so people in a local race. As I write this, it’s dark, wet and below 10° outside. But I will still go for my run, because I am so used to being committed to doing it. The only thing that can stop me is me. Moreover, I know that when I don’t want to run, the reward of completing the run is so much greater. Put one foot in front of the other. Take action, starting today. Don’t focus on negative things that have happened in the past, or what potentially might become an obstacle in the future. The past and the future do not exist. They can’t help you. All you have is now. Make the most of it. Don’t compare yourself to others and concern yourself with how much better they are, what they have that you don’t. You have no idea how capable you are, because you have never given yourself the chance to find out. Now is the time to make a commitment to push your boundaries of limitation and overcome self-limiting beliefs. Simply focus on being here right now and identifying what you can do in this moment to take a step towards your goal. Small steps quickly develop into strides. Make every day count. Don’t waste time on negative people and negative influences. Don’t sit around worrying about things that are out of your control. Put your time and effort into bringing about sustainable positive change in your life. Don’t make excuses: The rain is not an excuse not to go for a run. Being stressed out is not an excuse to go out and buy a packet of cigarettes. The weekend is not an excuse to go out and eat junk food. Overcoming these challenges is part of the suffering that you have to go through to make sustainable, positive change. The short answer to retaining positivity throughout the year is to think of your life in terms of now, in terms of moments, not in terms of years. The wonderful thing about making a daily commitment to positive change is that every day brings with it the positive reward that you are making progress, that you are overcoming adversity, that you are taking your mind to places that it has never been before. You are exploring yourself in uncharted terrain. You are learning more about your capabilities and pushing the boundaries of what you thought was possible. Once you start the ball rolling you will begin to reap the rewards of having an intentional and purposeful life. Life is all about the journey, not the goal. This might sound cliché but is absolutely true. It is what you learn along the way that brings the greatest reward. It is the people you interact with, the people that you learn from, the knowledge that you gain, the people that you end up influencing and inspiring. Don’t focus on the mountaintop; focus on appreciating the valleys you traverse along the way.